- Buy your tickets for King Arthur's Labyrinth below or buy a Combined Ticket to also visit Lost Legends of the Stone Circle - you will get half price admission to Lost Legends of The Stone Circle. -Tickets can NOT be bought on line for today. However, please arrive early and buy your tickets at the King Arthur's Labyrinth reception on arrival. Additional boats will be sailing, only some are available to book online. - Please choose the date and time of your King Arthur's Labyrinth sailing first using the calendar below. You can visit Lost Legends of The Stone Circle on the same day, either before or after your Labyrinth adventure. Please note that last admissions to The Stone Circle are at 4.30pm. -Please check that the sailing date and time is correct before clicking "Checkout". -Please arrive at our Reception 30 minutes before your sailing time. - Click "More Information" below to buy tickets for Lost Legends of The Stone Circle only. 1. THE TIME YOU BOOK IS THE TIME THE UNDERGROUND BOAT SAILS. PLEASE ARRIVE at the King Arthur's Labyrinth reception AT LEAST 30 MINUTES BEFORE THIS TIME with some personal identification to claim your tickets, to sort out helmets and to prepare for sailing. 2. If you are running LATE PLEASE PHONE US at least 45 minutes before your sailing time and we will do our best to RESELL YOUR TICKETS AND THEN MOVE YOUR SEATS TO A LATER BOAT. On busy days this may be at a considerably later time or not possible at all. In the event that we are not able to resell your tickets, we regret that a refund will not be given as your previously booked seats will have sailed into the Labyrinth empty. Furthermore, in these circumstances, if you wish to sail on a later boat, then new tickets must be purchased for the new sailing time. 3. We regret that we are unable to refund payments for seats which are not claimed on time. 4. Every effort will be made for boats to sail on time. However, the boat may sometimes be delayed for reasons beyond our control. 5. 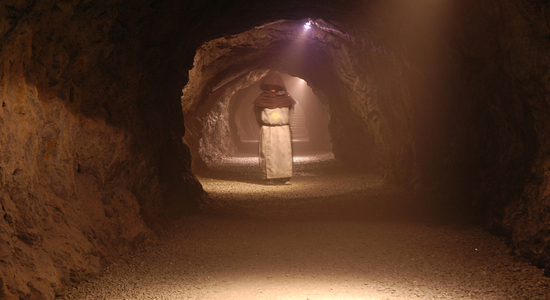 During periods of persistent heavy rain the pathways in the underground caverns occasionally flood which makes it difficult to walk through the Labyrinth. In such weather conditions, we advise that you contact us, in advance of travelling, to ensure that underground trips into the Labyrinth are running. When we have had to close the Labyrinth due to pathway flooding we will either rebook your boat seats or provide you with a full refund for your tickets. 6. In the unlikely event that we are unable to operate the underground trips you will be contacted by telephone, if at all possible, at the earliest opportunity and your visit will be rearranged or a full refund will be made. The Labyrinth adventure is not suitable for those who would have difficulty walking at a steady pace in an underground tunnel in dim lighting. The Labyrinth adventure may not be suitable for very young children. Please read carefully the - Additional Information for Parents, or Guardians, of Young Children below. The temperature underground is cool (10 C, 50 F) whatever the weather. For your own comfort, please wear warm clothing and suitable shoes Paths: The paths underground have no steep slopes and are surfaced with gravel. The surface can be a little uneven and can sometimes be a little muddy in parts. There are two steps down into the boat on boarding and two up on disembarking. Lighting: The tunnels are lit throughout but at a subdued level. Walking Distance: Deep underground, you explore the Labyrinth on foot, a walk of about half a mile, stopping from time to time. Walking Speed: A steady pace which is pre-set and cannot be slowed. Please keep up with the person ahead of you and stay with the group at all times. If you find that you have to travel more slowly, please let your Boatman know and then walk at the back of the group. You can then travel at your own pace and the Boatman will ensure that you do not get lost. However, you may miss the start of some of the presentations. Helmets: Safety legislation insists that you wear the helmet provided at all times. The tunnel roofs are uneven and are low in places but are generally around 6 ft high. Take care not to bang your head Only guide dogs are allowed underground. Guide dog users should consult reception staff about the conditions their dog will encounter underground. Flash photography or the use of personal lights of any sort can spoil the visit for others in your group and are therefore not allowed underground. Smoking is not allowed underground. This is a legal requirement. Misbehaviour of any sort will result in the offender being removed from Company property forthwith without any admission charges being refunded. No person who is considered by employees of the Company to be under the influence of alcohol or drugs will be allowed on the tour and no refund will be given. The Company reserves the right to claim compensation for any damage to Company property, however caused. There are no toilets underground. If you are carrying your child, please do not carry them on your back. The tunnels are low in some places and a child on your back would be very vulnerable should you duck to avoid a low roof. By carrying your child in front, you will ensure that its head is always lower than yours. King Arthur's Labyrinth may not be suitable for very young children; please consider this when booking your tickets. If your child gets upset during the visit and makes a noise during the presentations, please move a little way from your group to avoid spoiling their experience. Your guide will assist you where necessary. The rules insist that everyone underground wears a helmet at all times. Sadly we cannot find children's helmets that meet the Health and Safety requirements so they have to make do with adult helmets. In the case of small children, the fit of the helmet can be improved if it is worn over a hat or hood. Push chairs can only be taken as far as the entrance tunnel to the Labyrinth and can be left there while you are underground. There are no Baby changing facilities underground but there are available in both the Ladies and Mens toilets. All children under the age of 16 must be accompanied by a responsible adult when entering King Arthur's Labyrinth. Children aged 16 years and over may enter King Arthur's Labyrinth unaccompanied. 1. As a guide, it is suggested, that you allow 1 hour to enjoy the mythical stories and all of the features contained in Lost Legends of The Stone Circle. 2. Last admissions to Lost Legends of The Stone Circle are at 4.30pm and the attraction closes at 5.30pm. 3. The time you book, is the time of your King Arthur's Labyrinth sailing. You can visit Lost Legends of The Stone Circle either before or after your Labyrinth visit. 4. Your visit to Lost Legends of The Stone Circle must be taken on the same day as you visit King Arthur's Labyrinth. Your ticket is only valid for this date. 5. Lost Legends of The Stone Circle is an open air attraction comprising a simple maze with flat gravel pathways. To access The Stone Circle itself, there is a slight slope up and a slight slope down. If this is a personal purchase and you are a UK taxpayer*, Corris Caverns can increase the value of your purchase without costing you a penny. If you tick the 'Reclaim Gift Aid' box and fill in your full name and home address details, Corris Caverns will be able to claim at least 25% extra from the Government on top of your purchase made through Visit Mid Wales. Your name and address will be forwarded to Corris Caverns in this case to allow them to claim the Gift Aid. *You must have paid UK tax this year at least equal to the 25% Corris Caverns will claim.